As wonderful as it all was in London, I was eager to be home. I absolutely love to travel to new places, but when I walk through the door of my home, I feel completely at peace. I suppose that’s where the saying “There’s no place like home” came from. I had a couple days off before I was to meet with Greg and John Hardy (owners of Sub Sea Research) and share information and pictures with them. They were eager to see and hear what information we were able to locate at the National Archives, and both Kathy and I were excited to share our findings. Stranded bird at sea. A little nourishment from the Sea Hunter crew and he’s on his way. I also missed the crew of the M/V Sea Hunter and Son Worshipper. We were like family, and of course I wondered how they got along without my cooking and cleaning up after them. I assumed the ships needed a good cleaning as they crew wasn’t known to pick up after themselves. But that was okay with me, as I knew they were working hard on other things. I was also eager to get back out to our site and continue working on the Port Nicholson project. It seemed funny to me, to think six months prior, I had only been boating (for pleasure) a few times, and here I was yearning to get back out on the ocean. I have friends who just don’t get how I could love working on a ship out on the ocean. How I could stand being gone for days at a time without any communication (no cell service). It really is hard to explain. I probably felt the same way prior to doing it. But once I experienced it, I had a complete change of heart. It’s just a feeling that grabs your entire body. When we are anchored on our site, 100 miles off the shoreline and you walk outside onto the deck and see water on all sides, you just feel so alive. As you look out into the water, the sun is gleaming so brightly that it shimmers, like there are diamonds floating on top of the waves for miles. The ship rocks at a steady pace that soothes you. And when you take a deep breath and inhale the pure ocean aroma, it is close to heaven. That is my very favorite smell in the entire world. Putting on a show for the crew of the M/V Sea Hunter. Though it seems we are the only ones out there in the middle of the ocean, (except for the occasional passing ship) there is always one constant, the seagulls. 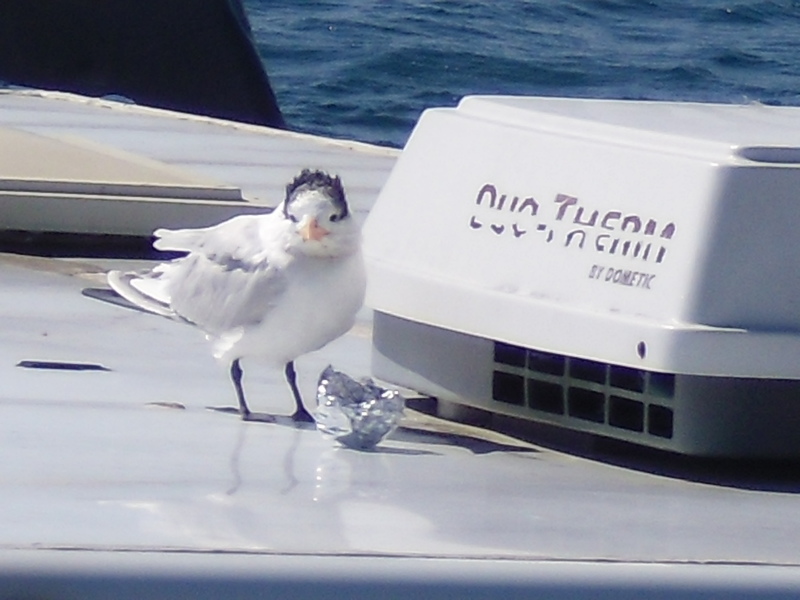 Rain, shine or wind, they are always perched upon our buoys or the A-frame. I sometimes sit and watch their actions. There may be six or seven lined up across the A-frame, bobbing with the ships every movement. Then, another one will fly towards the gull on the end of the frame, hover around him until he flies away, and then takes his spot. I’ve seen them do this a hundred times and could never figure out what or why they do this. Was it a game or just a more dominant gull enforcing his rights? This is still a mystery to me. The one thing that truly amazes me is when I find a teeny tiny bird, all by itself resting on our deck. How does this tiny little creature, with a 3” wing span somehow find itself in the middle of the ocean? I know it must be scared, as well as totally exhausted. They are usually hiding on top of one of the connix boxes or behind a piece of equipment. When I would see one of these birds, I would put out a small cup of water with sugar in it and cut up small pieces of bread. I would then leave him alone to eat and rest. When I would return a bit later, he would almost always be gone. Deep down I felt perhaps I helped him along his journey. Of course there are also all the wonderful sea creatures that show themselves at will. It doesn’t matter how many times you see either a pod of dolphin or a whale breach, each time is truly amazing. 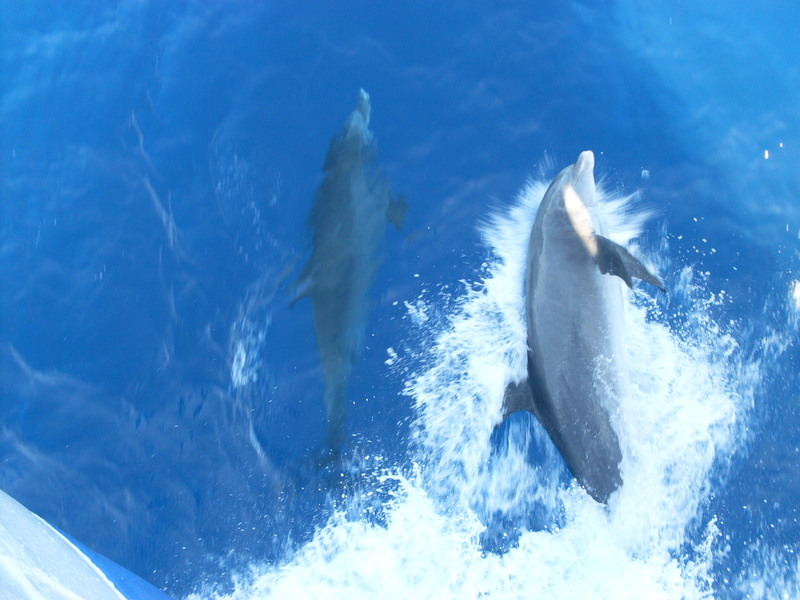 I remember the first time I experienced dolphins swimming alongside our bow; I could hardly contain my excitement. To watch these beautiful creatures swim as fast as the ship, in and out of each wave just takes your breath away. It almost seems like they know we are watching and they are giving us a show. Whenever a member of the crew sees this, the captain will get on the ship’s radio to inform the other crew members. We all grab for our cameras and quickly run to the bow. Sometimes they will swim alongside us for ten minutes and other times for a few seconds. I try to cease every opportunity to be in the presence of these magnificent animals. Me, appreciating the wonders of the ocean. 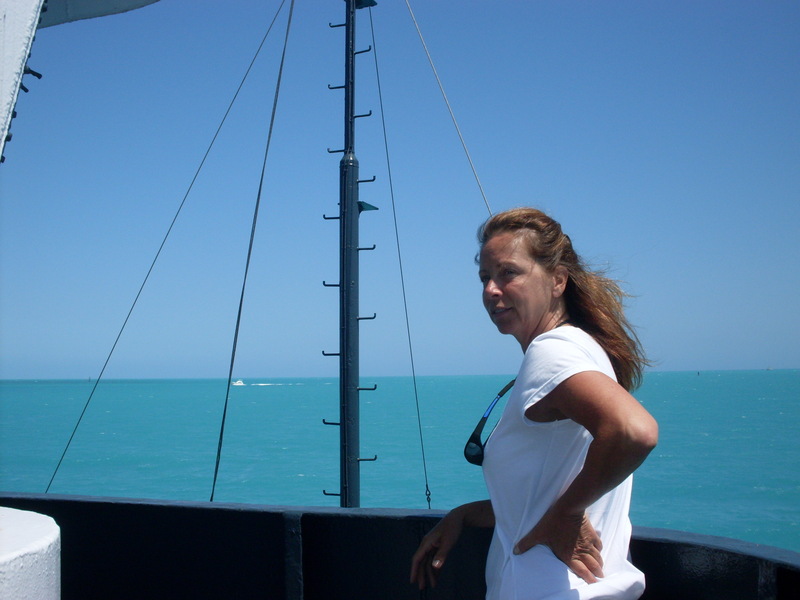 I will admit there have been times I wasn’t completely happy while at sea. When the crew is working hard, they haven’t gotten much rest and it seems nothing is going our way, it can be rough. Again, this is always hard to explain to others. While at dock, they build, they plan, they practice. Then, once out at sea, nothing goes right. It can take a toll on your spirit. Thankfully, that isn’t always the case, more often than not, things go as planned and the crew works together. Just like anything in life, you take the good with the bad; and I have yet to find anything that compares with a great day at sea.